While pasta is cooking, in 3-quart saucepan, melt butter over low heat. Stir in flour, seasoned salt, mustard, pepper and Worcestershire sauce. Cook over low heat, stirring constantly, until mixture is smooth and bubbly; remove from heat. Stir in milk. Heat to boiling, stirring constantly. Boil and stir 1 minute; remove from heat. Using wire whisk, stir in cheese until melted. Gently stir pasta into cheese sauce. Spoon into 4 ungreased 8-oz ramekins/gratin dishes or 10-oz custard cups. Place filled cups in shallow baking pan (or cookie sheet with sides). 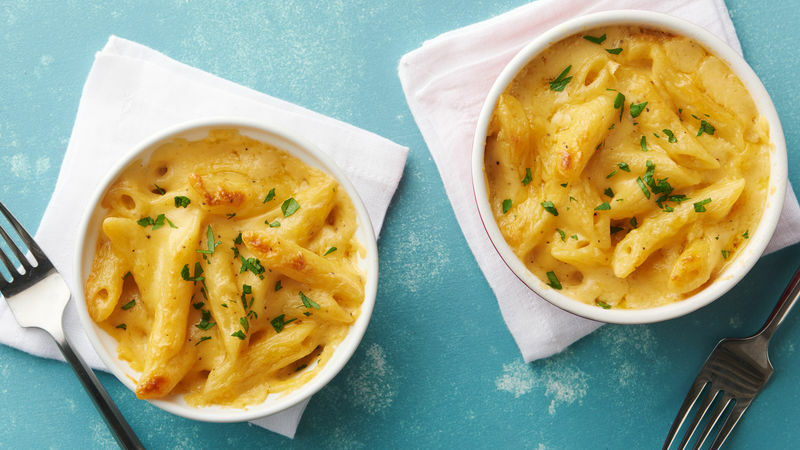 We've taken a comfort food classic and given it two taste twists. For over-the-top ooey-gooey goodness, sink your teeth into the Three-Cheese version; for zip and crunch, try the Mex Mac and Cheese. Thinking outside the box never tasted so good. Replace 1 cup of the Cheddar with 3 oz cream cheese, cubed, and 4 oz shredded Gruyère cheese. Sprinkle 1 tablespoon shredded Parmesan cheese and 1/4 teaspoon chopped Italian parsley over the top of each ramekin. Substitute 8 oz cubed process cheese spread with jalapeño peppers for the sharp Cheddar cheese. Stir in 1/4 cup salsa, and top with 1/2 cup corn chips, crushed. Four (4 1/2-inch) foil pie pans can be substituted for the ramekins, gratin dishes or custard cups.